Here we go here we go here we go !!!! The Clarity Elves are at the ready, all spit spot and ready to serve. 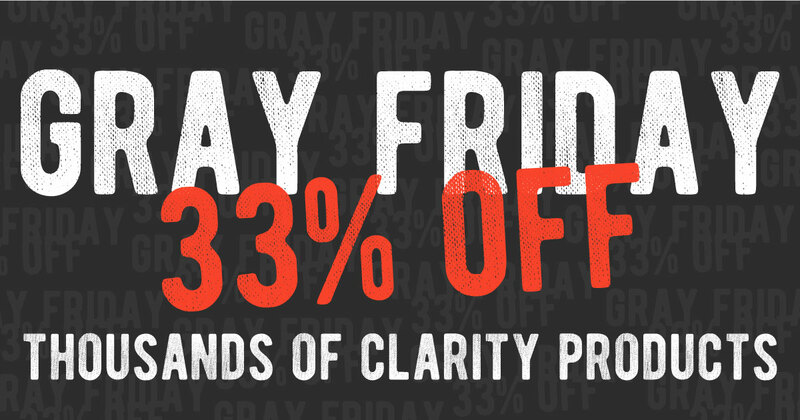 This, my friends, is the Sale of the Clarity Year. AND the Pergamano tools and products too! No no no. If we run out, we make more. That’s the best thing about being in-house manufacturers! I mentioned this yesterday, but in case you missed it…. 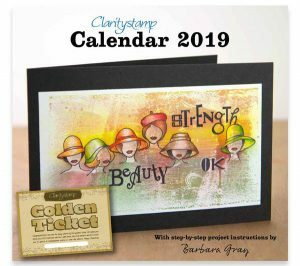 Just for fun, we have hidden a Golden Ticket in one of our 2019 Clarity Calendars. 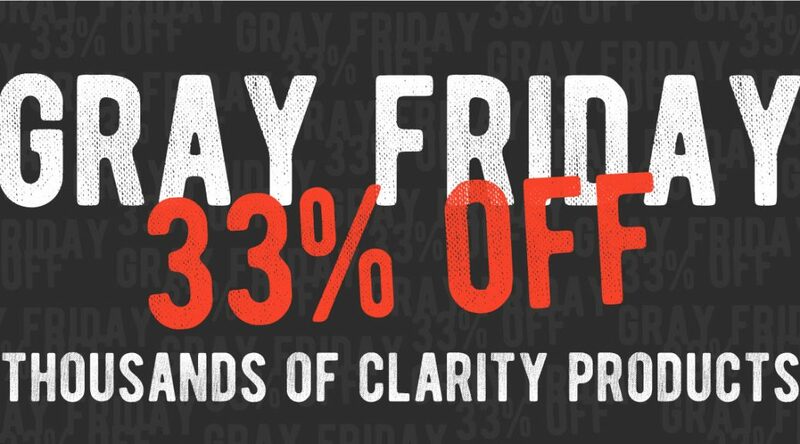 If you buy the Clarity Calendar 2019 over Gray Friday weekend, you could be the lucky winner of a Golden Ticket! What does this Golden Ticket mean? 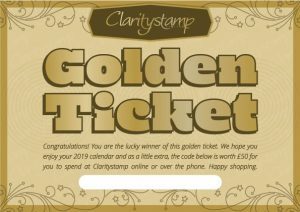 The Golden Ticket gives you £50 to spend on absolutely anything at Clarity, either online or over the phone. Already got a calendar? Well, get another one for a friend!! There’s only one hidden ticket. The Sale will go on until Monday evening. You can come back as many times as you like. And NO! We’re not going out of business! Are you kidding?? We’re only just getting revved up!! Paul did a great job on TV as usual, he’s a star. 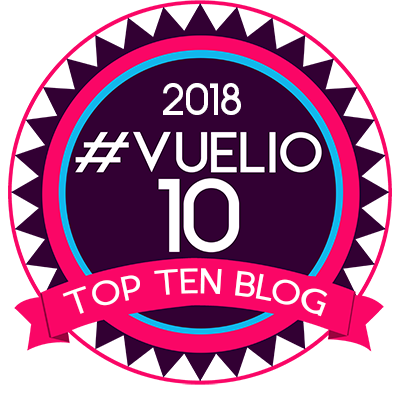 Didn’t realise you’d posted a second blog yesterday but did wonder why the goodies were put up a day early. Now I know. I spent the afternoon browsing all 100 pages and checking my stash to make sure I didn’t double up. It took a long time as each page took a while to load on my lap top. Placed my order straight away though. I think you may have co-opted some of Santa’s elves to help cope with all the orders as mine have all been delivered in 36-48 hours from ordering in this hectic week. The service has been terrific despite your warning of potential delays so thank you Barbara and the team for all your hard work. Wow – the order I placed last night has already been despatched. Now that’s service for you. Thank you, and thank you again 🙂 Keep going, you are all fantastic. Wow, what a week you and the Clarity team must have had. Thank you for having such a genuine sale. It is no wonder that you have such a lot of loyal fans and customers. I placed my order last night and wish I could have ordered more, but I just had to hold back, especially with Christmas coming up. However, I am not complaining, as Groovi Plates never run out and I can have lots of fun with what I have already. Put in an order last night and then spent the day thinking of the things that I had seen yesterday so just popped back on and placed another one! Couldn’t resist the added bonus of getting a golden ticket too, so in went a calendar. My order went in this morning I’m sure I will be popping back until Monday plenty of wonderful sale products how can we resist thank you to all at clarity. I’ve done it! 2hours going through the Gray Friday bonanza, after a very stressful working day. Well worth the effort and thank you to everyone who works at Clarity. Hi Barbara and everyone , after reading your blog today all your team must be worn out with all the hard work they are putting in getting all the orders out. I placed an order last night for a few things I needed , but need to go back and order a book I need will do this in the morning. Well Barbara you have looked after us all so well, hope the doughnuts are keeping you all well fed. Hope everyone has a great time enjoying their purchases. WOW what an amazing sale. All I need to do now is win the lottery.